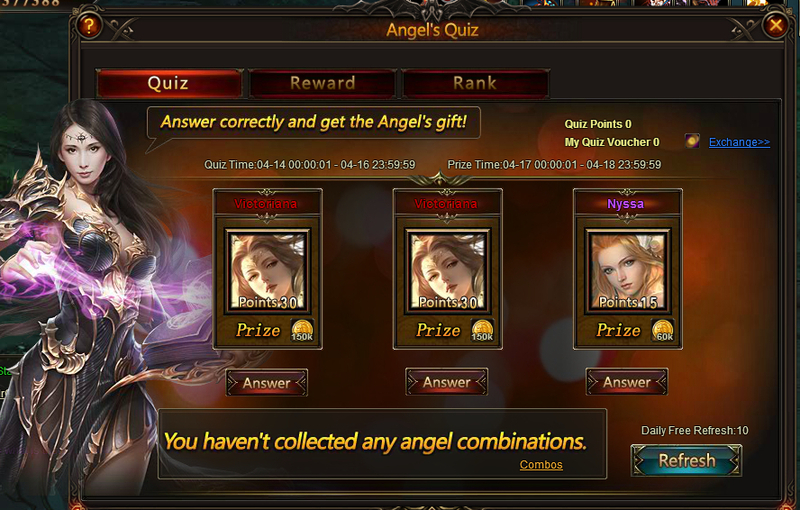 Angel’s Quiz is very much alike Quiz, in which you can answer interesting questions to win abundant rewards. What’s different is that, you can use a certain item called Quiz Voucher to “draw” angel combination to win even bigger prize. Each angel combination contains 3 questions. 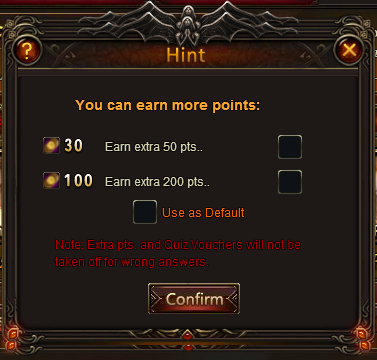 And each question holds different amount of gold rewards and question points. Making correct answers for each question will get you the rewards and points. Otherwise, nothing. The more points you get, the higher place you can stay in the Prize Rank. 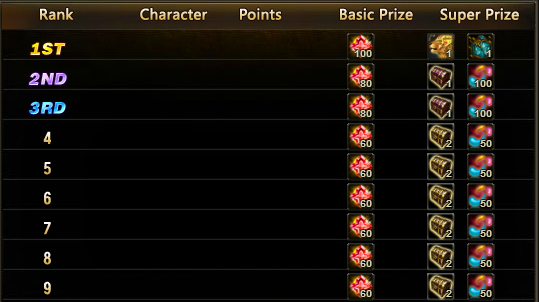 With different combinations, after answering them all, you can get rewards of different value. If you are lucky enough to get a specific combination and you answer them all correctly, you will get large amount of gold rewards and question points. Every day you can get 10 free chances to refresh the angel question combinations. Getting decent rewards or not will depend on how lucky you are. After you use up the 10 free chances, you need Quiz Vouchers to refresh question combinations. If you happen to be confronted with a question that you don’t know the answer, make a wild guess, maybe that’s exactly the answer, which will bring you fortunes. 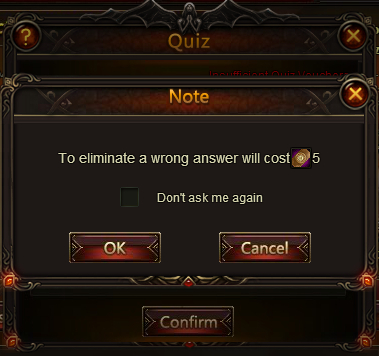 Quiz Voucher can be exchange by Vouchers, which is a very important item for Angel’s Quiz. Making good use of Quiz Vouchers can maximize your rewards. After clearing the 3 questions, you need Quiz Vouchers to refresh the angel question combinations. You can also use certain amount of Quiz Vouchers for each question to get more points. If you’re not sure about the answer, you can use 5 Quiz Vouchers to activate a Hint, and the system will delete one wrong answer from the four.